Term Four in any school is such a fast paced and exciting time for all of it’s community members and Aubin Grove Primary School is certainly no exception to this statement. Currently now in Week Seven, we can reflect back on what we have achieved over the past weeks, in addition to what we have to look forward to as the term draws to a close. I want to take this opportunity to thank the Aubin Grove community for accepting me with such a positive attitude in taking on Frank Pansini’s Principal role as he undertakes new system-wide initiatives at the Leadership Institute. I would like to pass on my appreciation to all of those individuals who have taken the time to talk to me about the recent changes that have occurred in the administration and to offer their support. It most certainly gives me the encouragement and confidence to forge ahead with Frank’s vision for Aubin Grove that he created with the community, now eight years ago. Our vision of ‘every student is a successful student and every teacher is an outstanding educator’ is our central driving force and sits at the forefront of every decision that we make here at Aubin Grove. 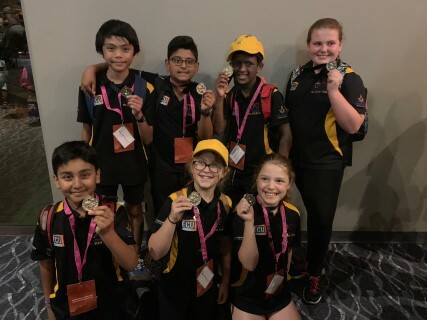 Earlier this term, we were thrilled to celebrate the hard work and dedication of our Tournament of Minds Social Science team, who, along with their facilitator, Mrs Ros Foote performed their solution to the presented problem to the highest level at the international competition, held in Darwin, Northern Territory. This earned them a Runners up/ Honours achievement, of which we are extremely proud of their teamwork. Thank you to Mrs Foote for her tireless efforts and support of this wonderful group of children. This excitement was followed up with the Junior Athletics and Interschool Senior Carnivals, where the principles of the Fish Philosophy in how our students acted and interacted on this day was clearly evident for all to witness. Both carnivals had such an atmosphere of fun, through friendly competition for all, in addition to the great sportsmanship and team skills that were on display. Congratulations to all who were involved in either day and well done to the interschool team for placing third overall. Continuing in the theme of change for this term, we will be releasing our semester two school reports as an electronic version to all families, to align ourselves more closely with the direction of the Department of Education. In addition to the environmental advantages to sending the reports in this format, all families will receive their reports in a timely manner and they can be sent to two email locations, if required. Once you receive your child’s report in your email inbox, click on the link and then download, so you can retain a digital copy. This link will remain live for four weeks to allow you plenty of time to access and download the report. Please ensure that you let the front office staff know if your email address needs to be updated. Reports will be sent to families at the commencement of Week 10 on Monday 10th December. It is important to us that we regularly survey our community to hear the different perspectives on our performance as a school and to assess where we need to target our future direction. Your opinions matter to us and we want to hear them! Earlier this week, you would have received a link via your email from our Deputy Principal, Kathryn Grzelec, requesting that you take a few minutes to provide us with this all-important feedback. It will only take a short minutes of your time, but will provide us with a wealth of information. This survey will remain open until the 26th November 2018, after which time the results will be analysed and shared with the School Board and wider community. Finally, to celebrate our conclusion of 2018, our excitement is growing observing the preparations now taking place for our end of year events. These are such special occasions for our whole school community, as we share together in a joyous occasion, the successes we have experienced together as a school, closing its eighth year. It’s is such a privilege to experience these occasions as an administrator and staff member; watching our families take the opportunity to socialise with each other and enjoy the visual spectacle that the whole school provides through the performances. This year, we will be holding our Kindy Concert first on Wednesday 5th December at 5:30pm. This performance will commence after a picnic for families on the lawn area outside the undercover area. Our Pre Primary to Year Six End of Year Concert will then follow in Week 10 on Tuesday 11th December, from 5:30pm. This concert will take place on the oval and both occasions will have a sectioned off area for families to take photos of their child’s performance. Please reserve these upcoming dates in your diaries so you can join in with these wonderful whole school celebrations. We are also crossing our fingers for fine weather for both occasions, so families take the opportunity to walk to these events to ease the traffic congestion around the roads! Thank you to all for your continued support of our students and school. If you see me out and about in the school grounds and I haven’t met you before, please come over and introduce yourself. I love getting to know our Aubin Grove families and my door is always open. It is that time of year again where we will be partnering with the Salvation Army Christmas Appeal. Aubin Grove has supported this appeal for many years, but it would not be possible without the generosity of our families who have bought in non-perishable food items. Each classroom has their own collection box accompanied by a poster of suggested items, and families will have time to contribute up until Monday, December 10. Thank you so much to all of the families who have been so generous in donating to the Salvation Army’s Christmas Appeal and helping to make Christmas brighter for families in need.